HONG KONG, Aug 13, 2015 - (ACN Newswire) - The summer trade fair season has moved into full swing with the opening today (13 August) of four high-profile events organised by the Hong Kong Trade Development Council (HKTDC). 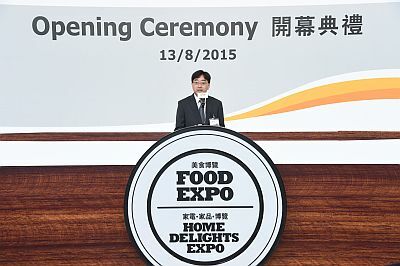 A total of more than 1,600 exhibitors are participating in the HKTDC Food Expo and HKTDC Home Delights Expo (13-17 August) as well as the Hong Kong International Tea Fair and International Conference & Exhibition of the Modernization of Chinese Medicine & Health Products (ICMCM) (13-15 August). The four events are being held concurrently at the Hong Kong Convention and Exhibition Centre. The 26th edition of the Food Expo gathers around 1,200 exhibitors from 24 countries and regions. New exhibitors this year come from Ukraine and the United Kingdom. The Food Expo comprises three sections; Public Hall (13-17 August) including seven international pavilions from Canada, the Chinese mainland, Japan, Korea, Malaysia, the Philippines and Taiwan; Gourmet Zone (13-16 August) with the themes of Western Delicacy, Asian Cuisine, Chic & More, and Sweet Delight; and Trade Hall (13-15 August) including 14 group pavilions. The New South Wales pavilion, located in the fair's Trade Hall, returns to the expo showcasing a selection from high-quality Australian food producers. Spicing up the Food Expo this year, there are two new sector-specific zones. The Halal Food Zone has attracted some 60 exhibitors from Brunei, the Chinese mainland, Indonesia and Iran. Among the highlighted products are Pink Rose Bud, Pistachio, Blue Shrimp and Saffron. Meanwhile, the debut Food and Agricultural Technology Zone features six exhibitors showcasing innovative solutions to food production and consumption, such as food grade capsules for targeted drug delivery. A variety of seminars are taking place during the Food Expo, examining latest industry trends including healthy eating, marketing on the Chinese mainland and more. There is also plenty for the general public to sink their teeth into, with cooking demonstrations, competitions and workshops taking place throughout the fair. The Night Bazaar, an annual highlight, will open to public ticket-holders from 7pm to 10pm each evening from 13 to 16 August, featuring around 60 exhibitors from Food Expo and Home Delights Expo. Following a successful debut last year, the HKTDC Home Delights Expo returns for its second edition, this time featuring more than 120 exhibitors and over 190 brands. The event comprises two themed zones highlighting Electrical Appliances and Household Products while a new premium zone, Avenue of Delights has been launched to showcase more than 60 popular brands. Visitors can also try local snacks such as mango rice mocha, egg waffles and giant fish balls at the new Hong Kong Street Food section at the Expo. Professional chefs are on hand demonstrating food preparation ranging from street cuisine to vegetable art at daily cooking demonstrations, while a popular Smart Bidding Game will be held daily from 13 to 16 August. A highlight event today is the Cooking Fun with Kids demonstration with Zhu Fan Zai. Running through 13-15 August, the seventh edition of the Hong Kong International Tea Fair combines a range of business activities with events that celebrate the culture and traditions of tea. In terms of business, more than 230 exhibitors from 12 countries and regions are featured at the fair, representing such prominent tea-producing countries as the Chinese mainland, India, Japan and Sri Lanka. Among the 15 group pavilions are debut pavilions from the mainland province of Jiangxi and the Japan External Trade Organization. The Tea Forum on 15 August presents seminars featuring prominent speakers such as renowned Chinese medicine practitioner and author Dr Jenny Yeung Ming Ha, IDG Concept Brand Designer Mr Tommy Ng and Tea Master Mr Ip Wing Chi. Various tea tastings and tea art performances by Japanese and Chinese experts are also being held during the fair. Once again, the International KamCha Competition, featuring traditional Hong Kong Style Milk Tea, is taking place during the fair with the final round being held at the Tea Fair's Tea Gallery on 15 August from 1:15pm. Meanwhile, today's Tea Fair events include the award presentation for the International Tea Competition 2015. Co-organised by the HKTDC and the Modernized Chinese Medicine International Association Ltd, this year's ICMCM features more than 120 exhibitors from nine countries and regions. The three-day fair (13-15 August) demonstrates the international appeal of Traditional Chinese Medicine with exhibitors from France and the United States joining Asian counterparts from Hong Kong, the Chinese mainland, Korea, Macau, Singapore and Taiwan. A high-profile two-day ICMCM Conference (13-14 August) opened today under the theme of "CM Research & Commercialization on Cardiovascular Diseases". Meanwhile, the University of Hong Kong is the coordinator of the 11th International Postgraduate Symposium on Chinese Medicine to be held tomorrow. Complementing these events will be Exhibitor Forums featuring new products and services as well as a seminar on testing and certification of Chinese medicine. The ICMCM's Chinese Medicine Health Public Forum will be open to the public on 15 August while, throughout the day, events are organised to highlight various aspects of Traditional Chinese Medicine as well as some of the latest products in the market. Established in 1966, the Hong Kong Trade Development Council (HKTDC) is a statutory body dedicated to creating opportunities for Hong Kong's businesses. With 50 offices globally, including 13 on the Chinese mainland, the HKTDC promotes Hong Kong as a platform for doing business with China, Asia and the world. With more than 50 years of experience, the HKTDC organises international exhibitions, conferences and business missions to provide companies, particularly SMEs, with business opportunities on the mainland and in international markets, while providing business insights and information via trade publications, research reports and digital channels including the media room. For more information, please visit: www.hktdc.com/aboutus. Follow us on Google+, Twitt[email protected], LinkedIn.